What Is Capillary Action? 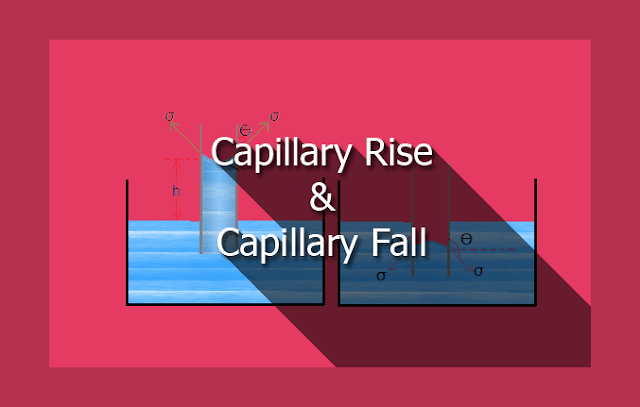 Expression for Capillary Rise/ Fall? What is meant by capillary? Capillary is a phenomenon of rising or falling of liquid surface in a small tube compared to the adjacent normal liquid level. The rise of liquid in tube known as capillary rise while depression of fluid level is known as capillary fall. Capillary depend upon density of liquid, surface tension of liquid and the diameter of the tube. The example for capillarity: blotting paper absorbing ink/water, chromatography, water absorption by sponges, soil water rises to surface by capillarity. Consider a narrow glass tube of diameter of d dipped in a liquid (say water). Water in the tube will rise above the adjacent liquid level. It is called capillary rise. Let σ = Surface tension of liquid. ϴ = Angle of contact between the glass tube and the liquid surface. 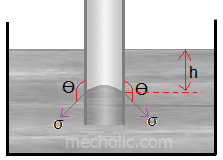 h = Height of liquid column in glass tube. Under equilibrium, two forces are acting on the water inside. The first one is weight of water column and second is the upward force acting on water due to surface tension. The weight of liquid of height h should be balanced by the force at liquid surface. This force at surface of liquid is due to surface tension. At equilibrium, the weight of liquid balanced by the vertical component of tensile force. Consider a narrow glass tube dipped in mercury, the level of mercury in tube will be lower than the surface level of mercury outside the tube. It is called capillary depression. Consider the mercury glass tube arrangement as shown in figure. Two forces are acting on the mercury inside the tube. First one is hydrostatic force that acting upward, and second one is downward force due to surface tension. In equilibrium condition these forces must be equal. Let h = height of capillary depression. 👉Capillary is the result of both adhesion and cohesion. 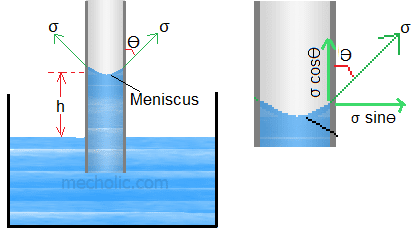 👉Curved free surface of liquid in tube is known as meniscus.